That’s right folks, it’s another Top 5. With the release of Tangled, critics are going wild telling us that Disney is finally “back on form,” but what exactly is Disney’s “form?” When you think about it, and discard the Pixar movies, it’s been a long time since anything worth getting excited about came from the world’s most famous animation studio. A lot of fuss was made over The Princess and the Frog but it didn’t seem to come to much, and before that we had such shockers as Atlantis to contend with. It seems in recent years, Disney has been left behind while other studios, namely Pixar and Dreamworks, tapped into the new world of animation, where there is just as much for the adults as there is for the kids. It’s not something Disney haven’t managed before, but they seem to have lost their way somewhere. From what I’ve heard about Tangled (and hopefully I’ll be able to back it up soon) they’ve finally got themselves back on track. If Disney has finally recaptured the magic, what are the movies we’re holding this latest offering up against? Here are my Top 5 Disney animations, the best of the cartoons that captured mine and many thousands of other people’s childhoods. Coming up with this list has actually been incredibly hard. It’s animations only, so no Pirates, but it’s been harder than I thought picking just five films from the vast back catalogue. The number one spot was easy, but narrowing down all my other childhood (and adulthood) favourites to just four spaces was tough. Knowing me, I’ll probably want to change it tomorrow. This is an incredibly underappreciated film, but it’s one of the best ones they’ve brought out in recent years. The characters are surprisingly realistic (I’m not talking about the aliens, obviously!) and it takes on some pretty tough issues with the kind of honesty that kids have grown to love in Disney. It also helps that it has a fun script and some great music, mixing Hawaiian tradition with Elvis classics. One of the school of Disney films that used a big name in comedy to inject some energy into the script. 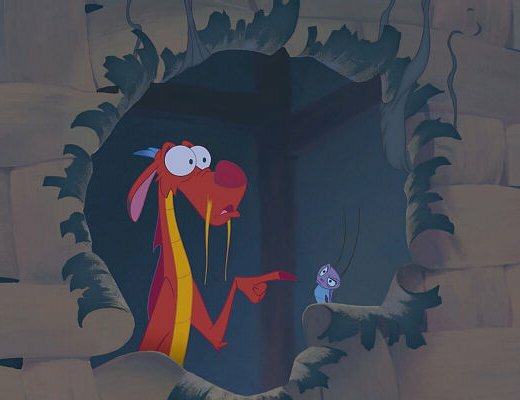 Eddie Murphy’s Mushu is perhaps now overshadowed by his Donkey (which sounds weird…) but the former character provides some great laugh out loud moments that I still find myself quoting on a regular basis. Music is another big factor in this movie, as it is in all of the Disney films since they are essentially animated musicals, with Donny Osmond lending his vocal chords to Shang (bet you didn’t know that did you?) Moments of intense drama are interspersed with show stopping musical numbers and comedy that the whole family can enjoy. When I was little, my three Disney loves were Dumbo, Lady and the Tramp and Robin Hood. Trying to pick which one to include was torturous, but in the end I had to pick Robin Hood as it’s one of the first films I can remember watching over and over again and never getting bored. Casting the famous legend amongst a group of woodland animals is brilliant in a way that you don’t even notice until you get older. Robin as a fox is a natural, but I also love Little John as a bear (voiced by the equally legendary Phil Harris) and Prince John as an immature Lion, shown up by his full maned older brother. More great music. More big laughs. Pure Disney magic. This was in my top spot film for two years until the film below came along. Robin Williams makes this movie. The genie is an iconic character and the improvised script (also found at the beginning: “it will not break! It will not break……it broke) is full of comedy that both the kids and their parents can enjoy. Aladdin has also given us one of the classic songs in the Disney songbook: A Whole New World and, along with Beauty and the Beast, was one of the first animations to use computer graphics in some scenes. 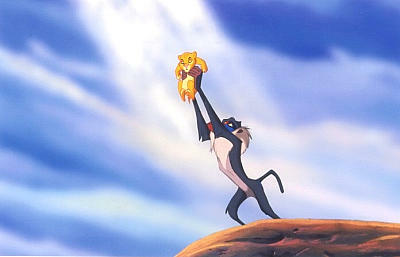 There really is no better Disney animation than The Lion King. They really hit on a masterpiece here. The story is compelling and full of heart, the animation is beautiful (the opening sequence is one of the best bits of animation I’ve seen) and the music is just stunning. Everything about The Lion King works. Seeing it for the first time in the cinema is one of my clearest early memories, and I love it just as much today. It’s not just my favourite DIsney film, but it’s one of my favourite films of all time, and I’m sure I’m not alone. Carrying on with my Top 5 posts (an idea not even slightly nicked from Ross vs Ross) let’s look at those lump-in-the-throat moments we for some reason can’t get enough of. I think everyone of my generation has this scene burned into their consciousness. It was our “Bambi’s Mum,” except this time, and for the first time in Disney history, there was a dead body on screen. Scary stuff for little kids. Add to that Hans Zimmer’s score and you have a really moving scene. Don’t worry though kids, he’s up in the clouds keeping an eye on things. Even though you can sort of guess where it’s heading, the tension is so high by this point that when that letter appears on the table we are right there with his family waiting to hear what happened. There is almost no dialogue and a very sparse piano accompaniment to go with some great acting from the young Jamie Bell. This scene is also the first time we see Billy’s family really getting behind him, as they all are obviously desperate for him to succeed. The fact that Jackie’s joy is so short lived brings us smack back down to Earth, emphasising what Billy is escaping, and how lucky he is to get out. I think this might have been the first film to really make me cry. I know that it tops the list of films tha make most men cry too, and I bet I don’t even have to tell you what scene I’m talking about. I can flick to this film while I’m watching anything else on TV and the effect will be almost instant. From here to the end of the movie is a cry fest for me. I’ve only managed to get through it dry eyed once, thanks to two friends (you know who you are) continually checking to see if I was crying yet. I always think Ben Affleck has had a bit of a rough deal when it comes to criticism, but he’s pretty good in this movie. Everything that happens in Forrest Gump is about him trying to get back to Jenny, which makes the ending all the more heartbreaking. Tom Hanks is fantastic as ever, and the dialogue is simple but effective. I love the final scene where he sits on the stump watching the school bus leave, because we know he is probably going to sit there all day waiting for Little Forrest to come back home. 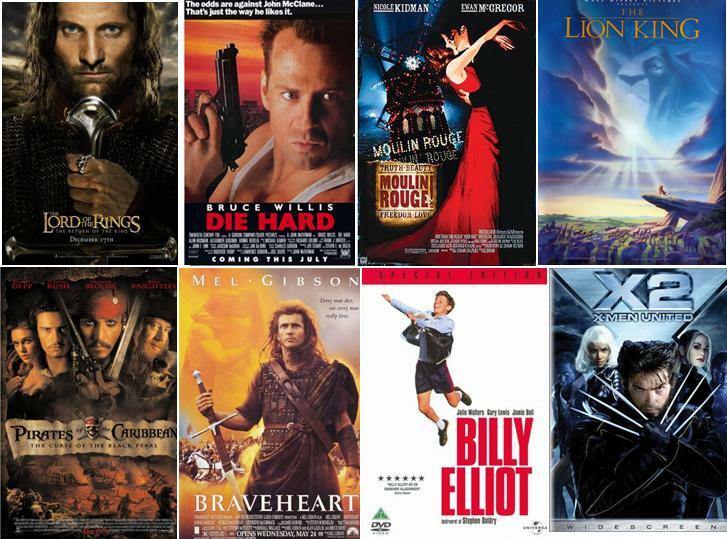 As I’ve said before, I can honestly only watch Braveheart once a year. I know that there are huge embellishments in this movie, but it is still essentially a true story. I’ve been to Bannockburn and I’ve been to the Wallace memorial; they are both incredible places. The part of this scene that always gets me is Robert the Bruce’s voiceover telling what happened to Wallace’s body, because that part at least is true, and shows just how ruthless the monarchy used to be when it came to so-called traitors. Despite being hugely outnumbered, with no resources and having just watched their leader being brutally tortured, the remains of his army still stood against the English. God I wish I was Scottish! James Horner’s score is absolutely magical. It holds all of the power of this scene. Hope I didn’t depress you all! I promise my next post will be more upbeat. Meanwhile if you want to share you’re favourite weepies please do. Interestingly, 3 of these movies made it into my Desert Island Discs picks. Guess we all need a good cry to keep us going.